The beginning of Football Season is always an exciting time in the Keystone State! 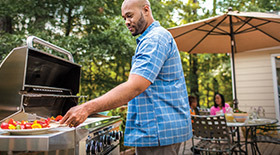 The Pennsylvania Propane Gas Association wants to remind our customers to take a quick refresher on Grilling Safety and other important tips to ensure a fun experience outdoors this fall. Small Cylinder Safety is equally as important, as we look to transport and refill Cylinders in advance of the Holiday get together with friends & family. Check out this informative video for a few great tips! If you have any questions or just need some advice from a professional, just contact your loc al Propane Marketer or find the nearest providers at this link. The Pennsylvania Propane Gas Association (PAPGA) is a member-focused trade association providing services that communicate, educate and promote the propane industry in Pennsylvania. The association was formed in 1947 to offer opportunities to learn through training and networking with peers, and to aid with legislative issues that contribute to operating a safe and successful industry. PAPGA continues to focus on education, networking and representing the interest of Pennsylvania’s propane businesses to the government, while assisting members in remaining current on topics vital to the propane industry. The Pennsylvania Propane Gas Association is affiliated with the National Propane Gas Association (NPGA) and the Propane Education and Research Council (PERC).